Kemp said the damage in Georgia likely wasn’t severe enough to qualify for federal disaster aid, though it’s too soon to know for sure. Rescue crews are using dogs and heat-detecting drones to search for victims of a tornado that’s blamed for killing at least 23 people in southeast Alabama. Lee County Coroner Bill Harris said at a Monday afternoon news conference that the children killed were ages 6, 9, and 10. Harris didn’t give other details about them. 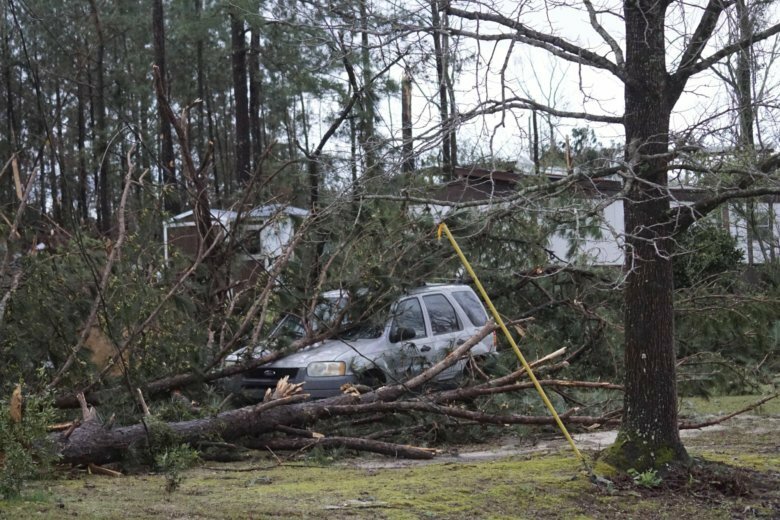 An Alabama sheriff says the death toll in an area hit hard by at least one tornado remains unchanged at 23, but officials haven’t completed their searches. Meteorologist Chris Darden said at a Monday news conference that the Sunday storm had a path nearly 1 mile (1.6 kilometers) wide, and 24 miles (39 kilometers) long, stretching toward Georgia. He said officials on both sides of the state line are surveying the severe storm’s damage. In Beauregard, Dax Leandro was helping clean up his buddy’s mom’s property Monday. Two structures there were obliterated, including the family’s house. He said some who were inside the house ended up “hundreds of yards away” beneath rubble and yet survived. In a tweet, President Donald Trump says he’s told the Federal Emergency Management Agency to give Alabama “the A Plus treatment” as the state responds to a deadly tornado that’s killed at least 23 people there. More than one child died in the storm, but Jones said he didn’t know the exact number. The State newspaper quotes staff members of the Red Bank Baptist Church in Lexington County, South Carolina, as saying that children sang “Jesus Loves Me” during a regular Sunday night service as storms moved through the central part of the state.